Corn silage is a high-moisture, fermented product that is used to feed cud-chewing animals such as cows and sheep. It can be made from a variety of grass crops including corn, wheat, oats, alfalfa, barley and rye. According to Joe Lauer, corn agronomist at the University of Wisconsin, corn silage has higher energy content than other forages. Also, corn silage production requires less labor and machinery time than other harvested forages making the cost per ton lower than other types of silage. Monitor the maturity of the corn to be harvested to create the silage. Walk the field and look for denting of the kernels on ears of corn, which is an indication the corn is nearing the optimum time for harvest. 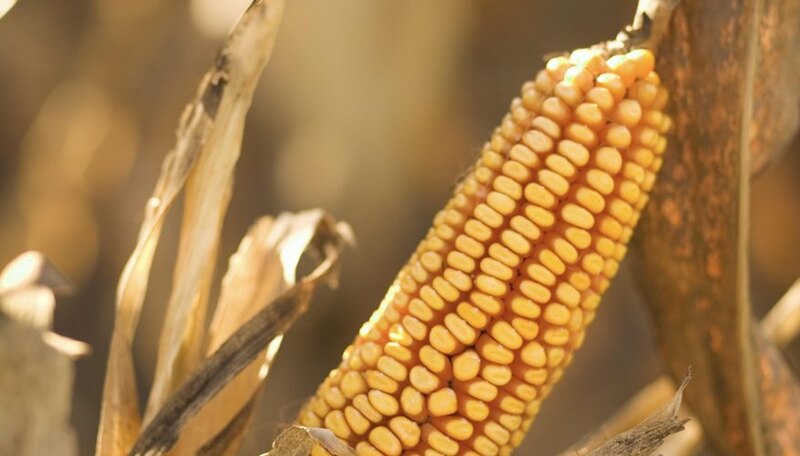 Perform a field test to get a rough idea of the moisture content of the corn. Remove an ear, remove the husk and break the ear in half. Take the top half of the ear and remove a kernel. Poke a knife blade or pin into the bottom of the kernel and slide it up until you feel resistance. The “milkline” is the area from the point of resistance to the crown. One-third milkline represents approximately 70 percent moisture, while two-thirds milkline represents 65 percent moisture; 63 percent is the level at which the corn should be harvested. Take samples of ears from several different plants to a qualified chemistry lab that specializes in agronomy. Have them analyzed for an accurate determination of moisture. Harvest the corn with a tractor-drawn or self-propelled harvester. The harvester cuts the corn stalk at the base just above the ground and then chops and grinds the entire plant into mulch. Compress the silage to remove as much air as possible. This can be done with a baling machine that forms compressed bales and then wraps them in plastic to seal out oxygen and begin the fermentation process. Silage can also be discharged into rows that can be rolled by tractors to remove air. Cover the rows with sheets of plastic anchored to the ground. Sample silage periodically and have it analyzed to monitor pH levels to determine when the fermentation process is complete. Fermentation usually begins in about 48 hours and the process is complete in approximately two weeks.